Incorporate the assembly language routines in your high level language applicationsAbout This BookUnderstand the Assembly programming concepts and the benefits of examining the AL codes generated from high level languagesLearn to incorporate the assembly language routines in your high level language... read more applicationsUnderstand how a CPU works when programming in high level languagesWho This Book Is ForThis book is for developers who would like to learn about Assembly language. Prior programming knowledge of C and C++ is assumed.What You Will LearnObtain deeper understanding of the underlying platformUnderstand binary arithmetic and logic operationsCreate elegant and efficient code in Assembly languageUnderstand how to correctly use inline AssemblyUnderstand how to link Assembly code to outer worldObtain in-depth understanding of relevant internal mechanisms of Intel CPUWrite stable, efficient and elegant patches for running processesIn DetailThe Assembly language is the lowest level human readable programming language on any platform. Knowing the way things are on the Assembly level will help developers design their code in a much more elegant and efficient way. The first section of the book starts with setting up the development environment on Windows and Linux, mentioning most common toolchains. 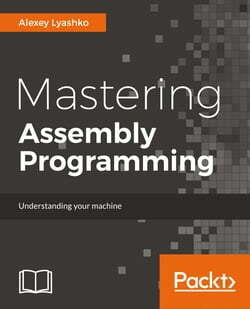 The reader is led through the basic structure of CPU and memory, and is presented the most important Assembly instructions through examples for both Windows and Linux, 32 and 64 bits. Then the reader would understand how high level languages are translated into Assembly and then compiled into object code. We will then show the privileged instructions by writing a bootloader and a tiny kernel. Finally we will cover patching existing code, either legacy code without sources or a running code in same or remote process.